The activity of Parliament is largely an argumentative activity. It involves speeches, law-making and debates. Mainly, those are argumentative debates. When I use the term Parliament I am refering primarily to the Argentine Parliament that is made up of the House of Representatives and the Senate. Broadly speaking, the objectives that parlamentary discourse have to accomplish are similar in different parliaments in democracies all over the world: to approve, change or modernize legislation, to represent interests of different sectors, to influence public opinion and to recruit and promote political actors. But the discourse of different national parliaments is subject to variation, at all linguistic levels, on the basis of history and context, cultural specificity and political culture. As is the case for all discourse genres, parliamentary discourse is also defined by its contexts. I agree with the point of view that holds that language, in general, and political discourse, in particular, shapes the people that use it. This is different from the common sense point of view that claims that people shape the language that they use. Namely in political discourse a representative expresses his/her opinions through the choice of vocabulary, the use of an established phrase and the set of statements from which they draw their arguments. Parliamentary discourse is primarly informative and deliberative. There are several kinds of discoursive structures that shape parliamentary discourse. Such speeches delivered in a parliamentary debate are unique. Speeches made in Parliament have to respect very specific rules. In a way they belong to the category of political discourse but in another way they have some differences that can be pointed out. Parliamentary debates share a number of characteristics of style and interaction with other forms of discourse such as the Speaker as moderator, the turn-taking structure, a formal lexicon, elaborate syntax, and the common structures of argumentation and persuasion characteristic of debates. What is unique in parliamentary debates, however, are obvious context categories such as the Setting (House of Parliament), the rules and types of sessions (ordinary ones, extraordinary and special), the representatives, members of the Parliament, hereafter MP’s, the objectives (different policies, etc. ), and the political knowledge and ideologies of the participants. In other words, although content and even style of speech in Parliament may be shared with other types of speeches, the function of such structures must be established in relation to the specific political situation: The speeches of MPs are making legislation, representing and playing politics. In the rest of this paper I will examine such categories in more detail, and I will study a specific parliamentary debate about reproductive health care. Since political discourse has a clear identity among social discourse, it is possible to recognize variations of political discourse in television, radio, and articles written by politicians. The labor of the Parliament is made not only in the Sessions but also in the Commitees that allow bills to pass to the House. If a bill has not been accepted or approved by the Commitee it will not be brought to the floor. The only alternative that a representative has is to ask permission from the Speaker to consider the bill, but then all representatives vote to admit or refuse it. This option has become more difficult as the House of Parliament adds seats. Leaving the lesser known and less powerful to the mercy of Commitee where they develop argumentation skills and recognition among their colleagues. In this way the oratory that has traditionally had a main role has decreased in importance in Parliament. In national history there were and, there still are a group of members, who have the ability to make speeches, debate and argue, in a way that they can impress and shock both the real audience and the indirect audience. The representatives themselves recognize the ability that everyone has to use his/her style not only on the floor but also in the media. They know that in looking at their political future, playing to the media is a point of extreme relevance. That is why when a representative does not want to consider a colleague’s argument they use the expression “you are speaking for the tv cameras”. This point is very well treated by Cornelia Illie (Illie, 2005, 6) who says that “a particular agonistic parliamentary procedure is for MPs to compete for the floor. In order to speak during a debate, MPs must try to ‘catch the Speaker’s eye’”[i]. Even in some cases an action can say more than an argument. For example, in 2002 during the debate about a bill that included the IMF, a representative asked for the floor, she stood up from her seat, went to the Speaker’s desk and left a United States’s flag. The media was advised in advance and the tv cameras recorded the scene. The days after, all the country’s screens displayed the representative’s success and the uncomfortable situation that the Speaker was put into. I will discuss a debate about reproductive health that occurred in Argentina, in the House of Representatives in the 4th Ordinary Session held on April 18th, 2001. It was not an open confrontation between different parties, but a confrontation between those MPs who were close to the Catholic Church meaning that they had to encourage the opposition to the bill. My references will be, the pragmadialectical theory of argumentation, Marcelo Dascal’s theory of controversies, the already quoted article by Cornellia Ilie and the article by M Agnes van Rees refering to the concept of dissociation. The debate, in fact, included two subjects. One was the creation of the National Programme of Sexual Health and Responsible Procreation and the other was the amendments to the Regulatory Law of the Exercise of Medicine. The bills were closely related but they were treated separately. I will discuss only the first one. The bill is related to a Programme that if passed would permit the distribution of contraceptives in public hospitals all over the country. At the same time it would establish sexual education in schools and other educational sites. The problems addressed were teen pregnancy and fatal illegal abortion. The target of the bill was to promote responsible behaviors among adolescents and to prevent the spread of sexually transmitted diseases (STD). It was clear that it was not an abortion law but it was seen by the Catholic Church as a step in that direction. I believe that this is a very interesting debate in order to apply different concepts from the pragmadialectic theory. In this case because of the subject matter and in particular the affects on women, not all MPs could say what they actually thought so they used strategic maneuvering in order to avoid making speeches that may have been seen as politically incorrect. I consider the session as a whole, a space in which it is possible to consider the different stages in the process of argumentation. The stage of confrontation, where the differences of opinion are defined. The opening stage, where various kinds of commitments are established that are the starting point of the discussion and serve as a frame of reference during the discussion. The argumentation stage where arguments and critical reactions are exchanged, and concluding stage where the result of the discussion is determined[ii]. Also I can look at each speech of a representative in order to consider the different stages proposed by the pragmadialectic theory. For this point I will use only two speeches as examples. I see the use of strategic maneuvering as making an intelligent choice from the options in ‘topical potential’ associated with a particular discussion stage, in selecting a responsive adaptation to ‘audience demand’, and in exploiting the suitable ‘presentational devices’ or style. But when she considers previous bills on these issues she explains that the House had treated bills such as this one. In the end even if they were passed they could not be applied because they were not signed. The bill was passed at this time but the President refused to sign due to the overwhelming pressure of the Church. The bill had to be treated again in 2004. It was then effectively passed and the Programme is currently in action. The speech also appeals to authority criteria. Several scientists, doctors, lawyers are quoted, as well as many international organizations, (UN, FAO (Food and Agriculture Organization), (PAHO) Pan American Health Organization and (WHO) World Health Organization.) The figures, percentages and the type of population involved in the problem is also considered to give weight to her argumentation. She states that poor women have higher risk of death having an illegal abortion than rich women. At this point the speech has some moments in which the MP uses histrionic tools to call attention to the bill. Here again I consider the text of Cornelia Illie about histrionic and agonistic features in Parlamentary Debate. I have to agree with the points that she makes in reference to MP’s as actors. In this case, there are different moments in which MPs from both sides perform to focus on the women that die because of procedures done outside of hospitals. During the presentation the MP had to clarify the concepts that she used and the way in which she referred to them. Several times she pointed out that the bill was not an abortion bill. But when other MPs asked for the floor they talked about abortion. When the presentation finishes, and the debate is opened giving other MPs the possibility to participate in the session, the consensus that was assumed actually did not exist. Many representatives, even members of the blocks of parties that had signed the bill, now wanted to debate not the bill but its grounds. The references made by these MPs always refer to the Catholic Church (and the opinions of authorities of the Church who made statements against the bill). 5. Dissociation in confrontation stage and in argumentation stage. In this case I consider it interesting to refer to the dissociation argumentative technique as employed by Perelman and M Agnes van Rees[iii]. In this paper I will explore the use of dissociation in order to bring the discussion back to the opening stage. She is making a new use of the concept. Both terms strictly speaking are medical terms but she wants to broaden their definition. In the same way she refers to the problems of the poor women who are affected by sexually transmitted diseases (STDs) and infections. Usually, dissociation is a move that brings the discussion back to the opening stage, since dissociation brings about a change in the starting points of the discussion. I will explore a speech in which dissociation is used in the argumentation stage, and the consequences of that use is the return to the confrontation stage. This technique, as we know, can be used by both the protagonist (defending), and the antagonist (attacking) a standpoint. That results in several possibilities for its placement in the succession of moves in the discussion. In the case considered when the debate is opened, a representative from the right wing asked for the floor and responded against the bill submitted . Her problem is that the bill spoke about poor women and she thought that the only difference that one should have in mind is between a weak and a strong person. A weak person can be poor or rich but is not able to debate about his/her own behavior so the problem is not about poverty but the lack of knowledge that they have. Here again the dissociation acts to change the orientation of the debate to focus on the point in which the arguer wants to arrive. In these cases, dissociation brings about a change in the starting points of the discussion. Now I will consider some concepts from Dascal’s theory. We will remind of the differences between discussion, dispute and controversy. From the point of view of their ends, “discussions are basically concerned with the establishment of the truth, disputes with winning, and controversies with persuading the adversary and/or a competent audience to accept one’s position. In discussions, the opposition between the theses in conflict is mostly perceived as purely logical, in disputes as mostly “ideological” (i.e., attitudinal and evaluative), and in controversies as involving a broad range of divergences regarding the interpretatio and relevance of facts, evaluations, attitudes, goals, and methods[iv].” Discussions follow a “problem-solving” model, disputes a “contest” model, and controversies a “deliberative” model. A discussant seeks to apply decision-procedures that provide knock-down arguments proving the truth of her position or the falsity of her adversary’s position; a disputant seeks to be acknowledged as the winner, regardless of whether his position is true or not; and a controversialist seeks to provide reasons for believing in the superiority of her position, even though such reasons do not conclusively prove it. Whereas a discussant is prepared to admit defeat if the adversary provides a knock-down argument against her position and a controversialist is prepared to acknowledge the weight of the opponent’s reasons, a disputant begins and ends the dispute (whatever its “external” outcome) convinced he is right. (3) You cannot be at the same moment against the bill and against the illegal abortion that leads to the death of poor women. Do not lie: if you are against those bills what you are doing is to allow and increase illegal abortion for the poor argentine women. In this case the representative is responding to the speech of a representative from the right wing who anounced that his block will not vote to pass the bill so she is answering and responding to a speech that was in the field of the dispute. There is no possibility of agreement. The whole debate can be seen as a controversy that in some moments changes to a dispute, but it is clear that the debate as a discussion is something that has been lost. Dascal also distinguishes between three ideal types of moves employed in polemic exchanges. A proof is a move that attemps to establish the truth of a proposition beyond reasonable doubt. For this purpose, it explicitly and obviously leads from other propositions (i.e., the beginning of the debate is full of figures about the problems of illegal abortion and teen pregnancy) to the proposition to be proved. (4) (…) 43% of maternal deaths are from illegal abortion. There are five hundred thousands deaths from illegal abortions per year and we are speaking of only documented cases when the women must go to public hospitals because of some injuries or problems that then causes death. (7) The suffering that remains is the lack of freedom. We cannot speak about freedom in Argentina if we, women, cannot decide with whom, how and how many children we want to give birth to. This analysis has shown the efficiency of using tools as proposed by the pragmadialectic theory in a specific case such as parliamentary debate. At the same time we have shown the weakness of parties’ identity when subjects like these are treated. Those points are beyond the traditional party identity, positions that are in fact personal and ideological. In those cases the appeal to strategic maneuvering and the use of different argumentative tools may address the situation but not solve the conflict. So representatives use concepts and words in a sense that are defined from one point of view or for his convenience. Our analysis tried to show that in debates when the subject treated is complex or has personal implications the parties’ identity fall apart and each representative must express his/hers beliefs. The arguments in these cases do not refer to the platform parties but to personal ideological point of views. Then a representative of the right wing can use arguments from the left wing and vice versa. They can also use the words employed before but give them another sense. We found that dissociation is a tool frecuently applied. In the same direction, the identification of moves let us know that figures, concepts, ideas, references may be used not only for one tenability but also as a skill that, if well employed, can impact audiences and change the public opinion. Nevertheless as each representative has a history in and outside the House, even if they reach tenability in their arguments the beliefs in their speeches can be weakened. [ii] Frans van Eemeren & Peter Houtlosser (Eds. ), (2002), Dialectic and Rhetoric. The Warp and Woof of Argumentation Analysis, Kluwer Academics Publishers, The Netherlands, p.132. Congreso de la Nación Argentina, (2001) Diario de Sesiones, Imprenta del H.C.D.N, Buenos Aires, Argentina. Eemeren, Frans H. van, Rob Grootendorst & Henkemans (2002). Argumentation, Lawrence Erlbaum Associates Publishers, London. Eemeren, Frans H. van and Peter Houtlosser, “Strategic Maneuvering. Maintaining a Delicate Balance”, (Eds. ), (2002), Dialectic and Rhetoric. The Warp and Woof of Argumentation Analysis, Kluwer Academic Publishers, the Netherlands. 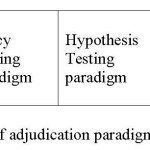 Eemeren, Frans H. van & Rob Grootendorst, (2004), A Systematic Theory of Argumentation. The pragma-dialectical approach, Cambridge.